Check out the new video of The Treehouse at the end of the photo gallery! It gives you a much better feel for the property, quiet location plus it shows the close proximity to the water's edge and dock.The Treehouse is a second story 2 bedroom apartment, 28x32. It has a full bath w/ tub/shower combination, a heat pump with electric heat and cooling, a range and refrigerator. There is a washer and dryer and 1/2 bath on the ground floor. Storage only on the first floor. Great for bikes if you bring some. The spacious living area with vaulted ceiling has a queen sleep sofa. The living area opens onto a deck through sliding glass doors. An electric grill is provided. 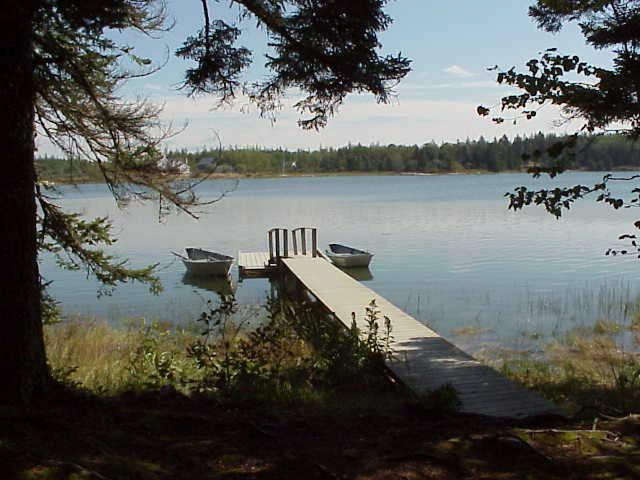 The shore of Bass Harbor is just a short stroll down the driveway where there is a shared dock with two other cottages, a row boat and kayaks for our tenants use. From this cozy space in an authentic fishing village visit Acadia National Park, Somes Sound(the only fjord on the east coast) and lots of shops, museums, and galleries in our 3 island towns. Countless artists and artisans are drawn to the region by its natural beauty. Out door adventures abound in this rugged landscape. Boat cruises, hiking, biking, and sea kayaking will reward you with spectacular scenery and views of wildlife. Native to Mount Desert Island. Located on the quiet side of the island, yet within 1/2 hour to any location on the island. A half bath with washer and dryer is located on the first floor for your use. We own water front property on Bass Harbor. It's a short walk from #3 to the water's edge where we have a dock and boats for our tenants use. #3 is located on Ann's Point Rd with access to Bass Harbor from our property or at the end of Ann's Pt Road there is public access. 1 queen, 2 twins, 1 sleep sofa. Row boat. goof location, short walk to the water, had fun kayaking. We have group of 6 visiting Acadia National Park in Labor's day. The location is awesome, just 10 minutes drive from a popular lobster restaurant. The living room is really good, and cooking tool set are very good. The Treehouse is located in a well-maintained, beautiful spot with other vacation cottages in Tremont, ME. It's a short walk down the gravel path to the dock where you'll find an assortment of kayaks and one rowboat, along with paddles, and lots of adult and kid life vests. This isn't waterfront property, but you can see the water from the patio above the rooftops of the other cottages. It's a short drive to a couple of lobster pounds, lots of great restaurants (the food at Sips is delicious! ), and a convenient drive to Bar Harbor, Acadia, etc. The house itself is clean, comfortable, and roomy. It was a nice place to come back to to relax after hiking, kayaking, and sightseeing. The gorgeous view of mature, healthy trees through all the large picture windows was very soothing. Having laundry facilities was convenient and my kids appreciated having a television with Netflix on the one rainy day we had during our stay. The appliances could stand to be updated (stove and toaster) and oven mitts would be great (I scorched my hand retrieving a tray from the oven because the dish towel didn't provide adequate coverage). It can also be noisy in the morning as the property management service vans/trucks show up early (anywhere from 6:50 am to 7:30 am), park directly underneath the two bedroom windows, and lots of thumping, banging, scraping, etc starts in the garage/storage area on the first floor of the Treehouse (i.e. directly beneath the living quarters we rented). It was not enough to put us off because we're early risers, but if you plan to sleep in on your vacation it will likely be an issue. We enjoyed our stay at this vacation home. There was a little confusion on our part due to the property photos and our belief that we would be right on the water. We stayed at property #3 which is not on the water but we could see the water from the balcony over the other properties. There are LOTS of steps up to the property. Not a problem for us and actually great exercise but I think it should be listed. The property owners were very responsive and actually stopped to say hello. The location is PERFECT! Close enough to Acadia National Park, which we visited daily. Bass Harbor, Bernard and Northwest Harbor all had great locations for dinner or lunch too. We walked each morning before heading out for the day (we took advantage of the 4:30 sunrise. Doesn't rise til 6:30 or so in Texas) and the wonderful cool temperatures. We would highly recommend this vacation home and visit again! Biking, beaching, hiking, canoeing, kayaking, whale watching, fishing, fine dining, shopping, museums, festivals, try bird carving, Acadia National Park etc., etc., etc. Please refer to Tenant Agreement for details of our Cancellation Policy.